My experience with Wildlife Rescue Association of BC (WRA) until now can be resumed in three valuable lessons: To be resilient, to be altruistic and to look for inspiration. WRA is currently treating birds that have been injured or orphaned. In the animal hospital, I experience nature’s resilience by actively participating in the healing process of our patients and this action reaffirms my commitment to value and respect nature. I am also involved in the logistics of WRA at the helpline contacting donors, volunteers and concerned citizens. These experiences have not only challenged me to be comfortable picking up the phone or tube feeding young birds, but it has empowered me to believe in the kindness of people. 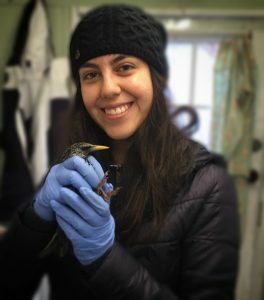 I am amazed at the support people can provide when they value the rewards of altruism such as the one experienced when that one hummingbird is released back into the wild. Having this experience through forestry co-op gave me the support I needed to feel comfortable exploring disciplines out of my comfort zone but that I realize are complementary to my degree.